Here is another GREAT gift idea! Do you know anyone who really likes tea? I LOVE tea! So, I really like the Elegant Floral Filtering Tea Mug. This is so feminine looking! 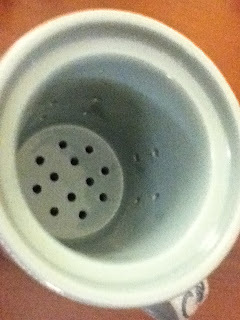 The mug comes with a ceramic filter to place your tea leaves/bag in. It also has a lid for steeping your tea. The mug is a pale blue with a darker blue floral design. Soooooo....pretty! I also received samples of Peppermint Tea, Cherry Almond Black Tea, Decaf English Breakfast Tea and Earl Grey Green Tea. 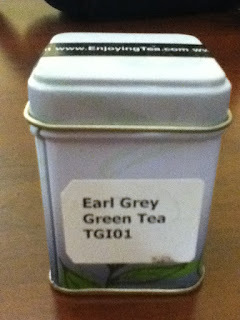 I decided to do a giveaway with the Earl Grey Green Tea. It is a small tin can, but I thought perhaps one of my neighbors would like to try one of these teas. 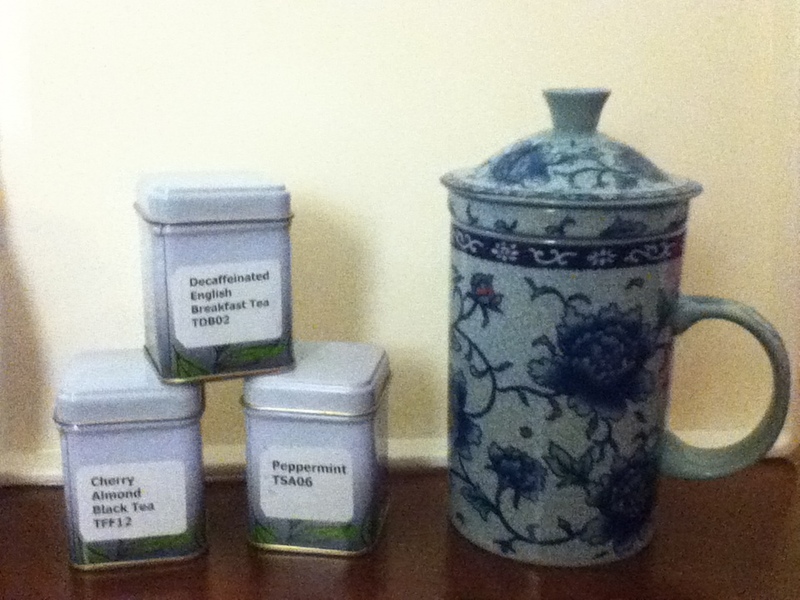 Enjoying Tea carries all kinds of tea pots, cups, and accessories, along with tea leaves, tea bags, and instant tea. I don't know if you can come up with a flavor of tea that they do not carry! I was amazed by all the choices on their site. 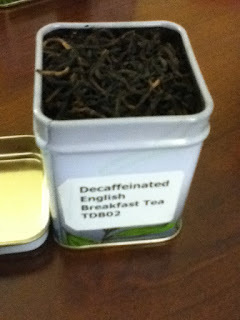 I really like English Breakfast Tea, and so does my 10 year old. We like to experiment with different flavors. They have fruit teas, green teas, white teas, black teas, oolong teas, and the list goes on. 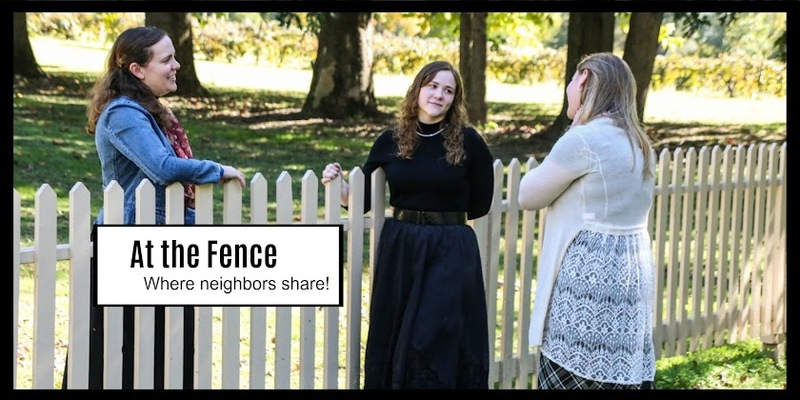 Just take a minute to stop by their site and see all that they have available. 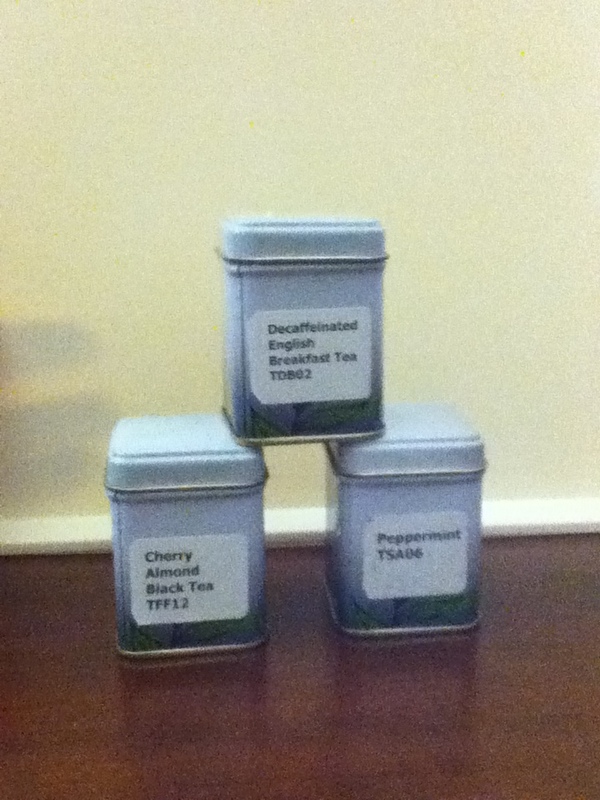 Above - Here are the three teas I received. Above - Here is the inside of the Tea Cup. 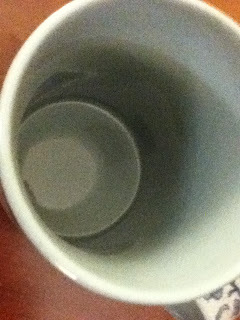 Above - Here is the inside of the Tea Cup with the little filter inside. 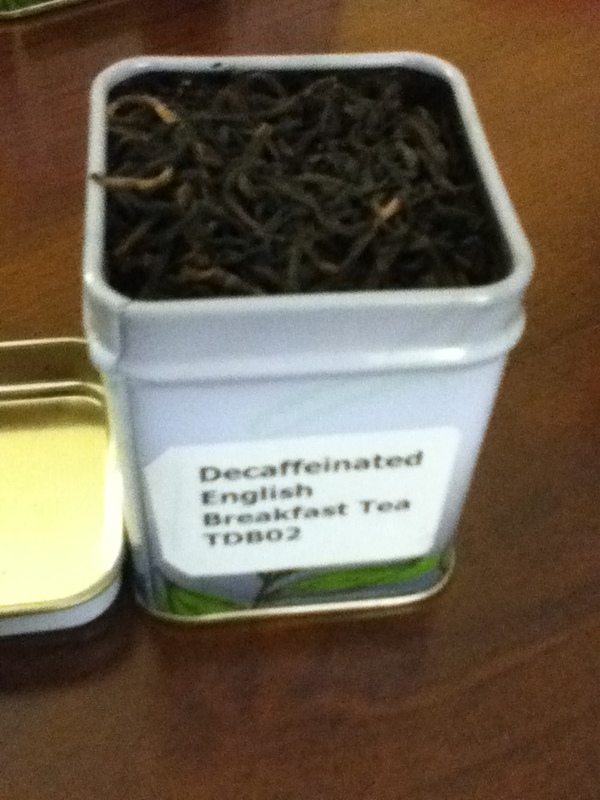 Above - This is the Decaffeinated English Breakfast Tea. 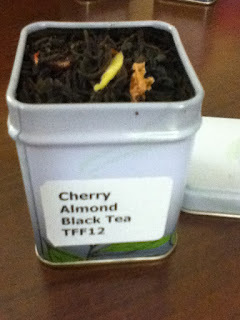 Above - This is the Cherry Almond Black Tea. 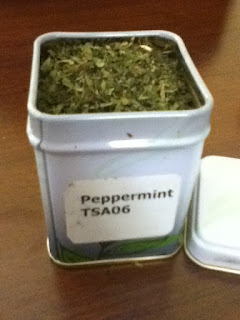 Above - And here is the Peppermint Tea. Above - This is the Tin of Tea that the winner of the giveaway will receive. The Earl Grey Green Tea! I think that the Decaf Chai would be good. The fruit flavored white tea sounds good. I would love to try the Cranberry Apple tea. I have tried many teas but never White Tea Pu-erh Pie. The idea of flaking tea off of a "cake-pie" is very interesting to me. I think strawberry green tea sounds amazing! I would love the Black Nail Head Cast Iron Tea Set! Thanks so much for the fantastic giveaway! I would love the peppermint! Seeing and taste so wonderful! Thanks for the giveaway. I would like to get their black tea sampler. The Cranberry Apple tea looks good. I might pick the "Fruit Flavored Green Tea Sampler"...lots of flavors to try this way! I'd love to try the Green Peony tea! i would get the vanilla chai tea! 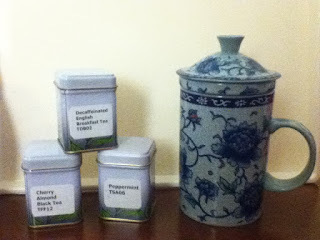 I like the Blue Squash Cast Iron Teapot and the peppermint tea. I like the Slimming Green Oolong, (Jade Oolong) tea. The apple flavored black tea sounds good too! I would love the fruit flavored green tea sampler! :D Thanks for the giveaway!! Plum Pear Black Tea please! I'd pick the Jasmine Dragon Pearl green tea. I WOULD PICK ANYONE AS EARL GREY TEAS ARE ALL GREAT TASTING. The Blue Teapot with Cup looks very adorable ! The Pineapple Black Tea looks so good! I would love to try the Organic Slimming Oolong Tea.